Colorado Crush took over Denver this past weekend. It’s the time of year when talented street-artists gather from all over the country to paint murals on Larimer Street in the heart of River North. 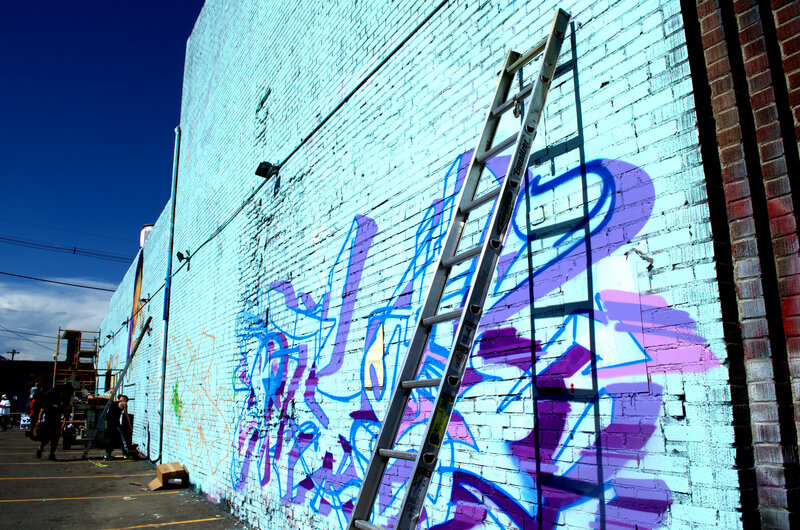 Colorado Crush is a great experience that emphasizes the process and re-creation of murals in the city. This street-art, music, and PBR celebration is more than a fresh coat of paint― it’s a fresh start. Check out photos from the event and pre-party here. The alleyway between 27th and 29th has been redone by so many talented local artists this year. There are tons of brand new murals, including the largest wall piece including colorful contributions by the Tats Cru via the Bronx. Other beautiful graffiti pieces were done by artists including Hef, Per, Such, Phetus, Reds, Sintex, Rock, Ewok One, Dread, Pistoe, Reps, Reks, Gamma, East, Clowns, Emit, Jolt, Kite, Nato, Jack, Fuse, and many more. One of my favorites is this powerful Native American homage done by artists Gamma and Sintex. So much talent, so little time. The Colorado Crush 2013 pre-party went down Friday night at the Guerrilla Gardens warehouse. The pre-party festivities included dope music from NYC hip-hop artist Matt Deca Kenney, as well as live painting by Tats Cru. The show also celebrated collaborative work by local artists Jolt, Swek, Bio, and Omni. Tats Cru is made up of world renowned graffiti artists Bio, BG183, Nicer, and artist Totem2 from Atlanta. True professionals in technique and in lifestyle, watching them paint in person was an unbelievable experience. Clean, sharp lines and complex three-dimensional design make the mural come to life. No wonder the vibrant graffiti work of Tats Cru can be found all over the world. I was fortunate enough to talk with Tats Cru member and traveling artist BG183. A gentleman even while sweaty and covered in paint, I caught him as he and Nicer had just put the finishing touches on the mural. BG grew up in the Bronx and boasts the New York accent to prove it. He is one of the nicest and most humble artists I’ve met, someone who inspires simply by the way he lives his life. 303 Magazine: What inspires you? BG: My job. It’s something that I love to do. Ever since I was a kid, watching my sister I was 4 years old and I was taken by it. Then in high school, I think it was junior high, or freshman year of high school I really started to love graffiti as like the art of illegality. It was something different, something new. Where would you paint when you were a kid in the Bronx? Anywhere. We’d paint on the subway, we’d paint on the concrete, on the ground, it’s just something I love to do. It doesn’t matter where, as long as I’m painting. I’m painting, I’m in that moment, and that’s it. Oh man. We just came from Seattle. We’ve been to Finland, Ireland, Japan, France. All over Europe. They really view graffiti and art differently there. It is more accepted, more celebrated. There are more artists over seas than in the U.S., like compared to back in New York, but I think we’re getting there. Where is your favorite place you’ve painted? Nowhere, everywhere, when I’m painting it doesn’t matter. I’m in that moment. I love my job, I love to travel, I hear people say, “Oh, I hate my job.” Not me. I love my job. I love every minute. Not many people can say that! One last question, where are you traveling to next? To travel, live, and breathe art is an awe-inspiring lifestyle. I loved my talk with BG as much as experiencing the other murals in the show. A jaw-dropping piece by Swek was blasted on the enormous white wall right when you enter the Guerrilla Garden. Denver-based artist and Guerrilla Garden host Jolt proudly showed off his works scattered around town in photographs on top of his wall piece. I was also infatuated with the colors and unexpected style used by Jolt. He did amazing work at the Colorado Crush event on Saturday as well, now lining the alleyway as the paint still dries. Get inspired by tons more photos of the Colorado Crush and Pre-Party streaming now in the 303 gallery. Follow @303Magazine on Instagram and our hashtag #303Graffiti for more of the beautiful works seen around town! WIN Tickets to Riot Fest on 303’s Twitter! Check out Colorado Crush Art Celebration.